LCOE provides a value that allows for consistent back-to-back comparison of different technologies based on the unit cost of electricity over the lifetime of a plant. The calculation includes the investment cost to build, fuel, operate & maintain, and decommission the plant. The chart to the left provides the minimum-maximum-average LCOE values for various operating technologies in the United State based on Energy Information Administration’s (EIA) 2018 Annual Energy Outlook (AEO). The grey bars on the chart represent the range of values from minimum to maximum with the colored bars representing the average LCOE unit cost for each technology. Profit projections for Holos Generators are dependent on the selling price of electricity. While current projections are based on the EIA 2018 average Year-to-date price of electricity in the U.S. (10.46¢/kWh), pricing is location-dependent. For example, electricity prices range from 7.51¢/kWh in Louisiana to 28.06¢/kWh in Hawaii. Due to low cost of electricity production, Holos generators are profitable across a wide range of electricity price fluctuations. Holos profitability projections, when added to the benefit of mobility, ensure that Holos can provide a competitive energy solution in a variety of markets and locations. 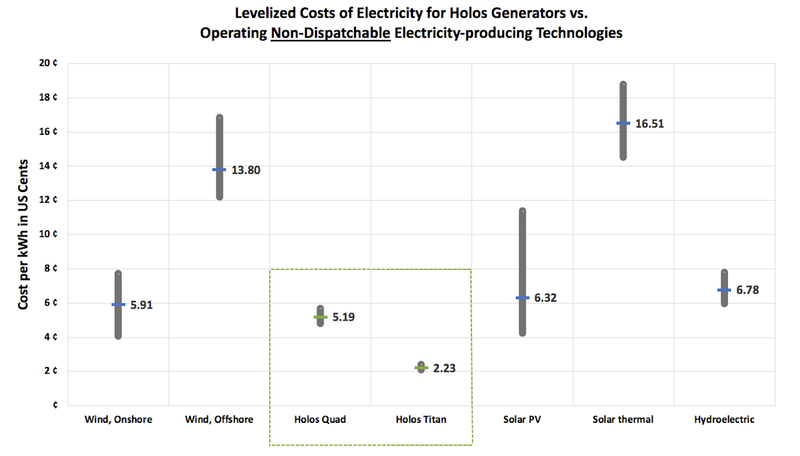 Holos Quad generators can achieve a payback period of under 3 years when the electricity produced is sold at an average price of 19.42 ¢/kWh. 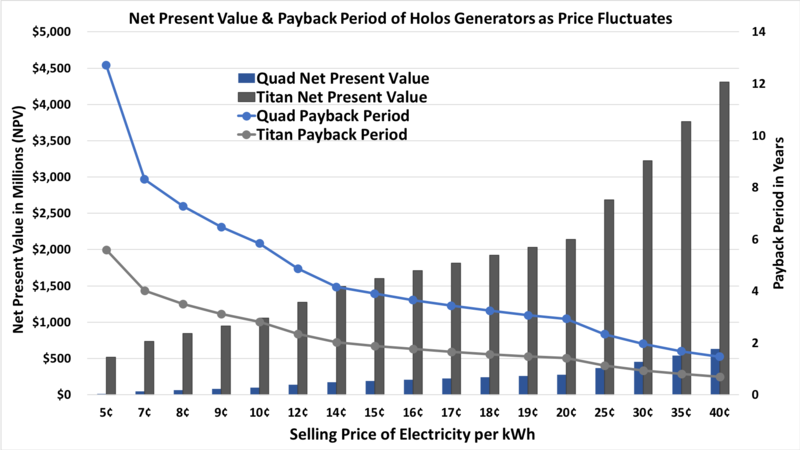 Holos Quad Titan generators can also achieve a payback period of under 3 years with an average selling price of 9.25 ¢/kWh. As Holos design architecture enables substantial reductions in the number of components to model and test to validate safety performance, licensing processing time and costs are proportionally reduced. Safety performance can be tested and validated with components operated at full-scale by leveraging low-cost operational test-rigs developed to support performance assessments of multi-megawatt waste energy recovery systems. As the Holos generators are formed by modules with relatively low power ratings and sizes (i.e. fits within transport containers), factory certification can be implemented by following regulatory models with quality assurance methodologies developed for the aviation industry, thus further lowering licensing cost. Licensing costs and processing time can also be reduced through optimization of conventional licensing processes customized to address small reactor designs (e.g., the fixed-price and expedited licensing procedures proposed by the Canadian Nuclear Safety Commission (CNSC), developed to accelerate commercialization of SMRs). Fully-operational versions of the Holos generator loaded with surrogate fuel cartridges (represented by non-nuclear heat sources), can be assembled to perform safety tests. Holos design features allow for low decommissioning costs as the fuel cartridges are sealed at all times and can be disposed of in standardized, licensed spent fuel storage containers without further processing. 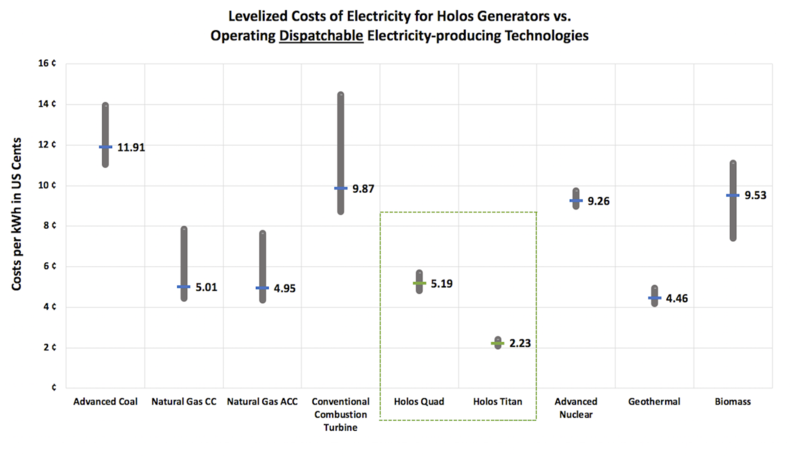 Costs for decommissioning Holos generators are estimated at $7.6M for Holos Quad and $42.6M for Holos Titan configurations (larger subcritical power modules). These cost estimates are based on publicly reported costing information adjusted for inflation for the decommissioning of Dresden Unit 1 and Vermont Yankee nuclear power stations. 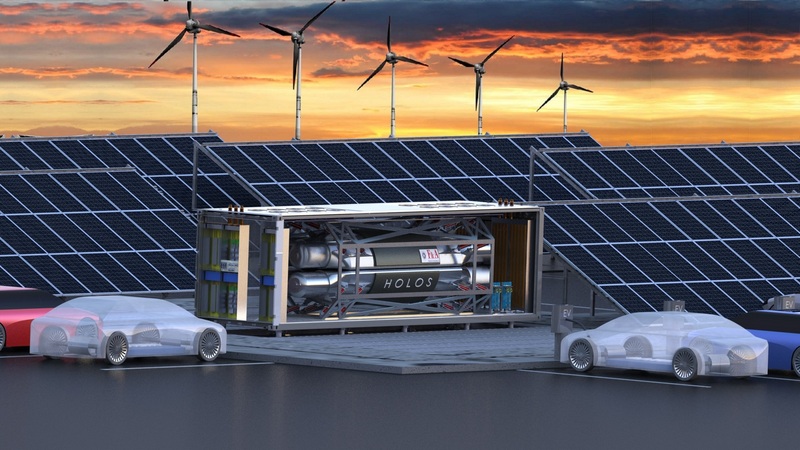 Holos generators’ near real-time load following, automatic operations, scalability and mobility features can accelerate market expansion for renewable and electric vehicles technologies by providing clean MegaWatt-class power generation at any location.